A new cell phone handset shaped like a traditional telephone, complete with rounded receiver and transmitter, hand cradle and even the curly tinsel wire, is turning retro cool into a big seller, with cell phone users snapping up the product. Sales have skyrocketed over the course of the last 12 months, with the increasing number of people who have sent their landline phones packing and become wireless only being attributed to the rise, as well as concern over cell phone radiation and the awkwardness of using a notepad-shaped device which needs to be held close to the ear. 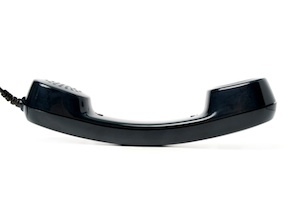 The retro handsets are generally compatible with cell phones and computers which have a 3.5 millimeter jack for earphones, including the likes of the iPhone as well as Android-based and Blackberry phones. They feature a button for hanging up and picking up directly from the handset. Hong Kong based manufacturer Native Union began selling its ‘Moshi Moshi Pop’ handset in the United States last year for $30, and now ships 30,000 to 40,000 sets per week, with the US outstripping China, Hong Kong and South Korea to become by far its biggest market.